Welcome to my Website in which I have tried to recall the two very happy years I spent aboard HMS Vanguard together with details of her creation and early demise, some of which are perhaps not too widely known. I hope you enjoy my pages and I would appreciate your e-mails with comments - good or bad - on the content or construction of the site. Any additional information or photographs relating to HMS Vanguard would also be appreciated..
A recommended Polish site of photographs of the warships of many countries together with links to numerous naval and military websites. Homepage - The opening music is entitled 'Royal Vanguard' and was composed by Sir Vivian Dunn as the ship's march for the Royal Tour of South Africa in 1947 and is played by the Band of the Royal Marines. Death of a Battleship - The ' Last Post ' was incorporated into funeral and memorial services as a final farewell and symbolises that the duty of the dead is over and that they can rest in peace. 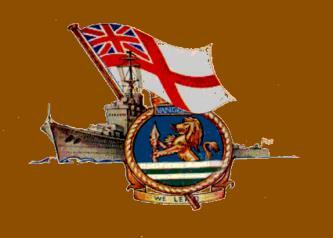 A Day onboard HMS Vanguard - Sunset - Played during the lowering of Union Flag /Ensign at the end of the day. HMS Barfleur - A very interesting site about this WW2 destroyer in the Pacific at the end of the war. Explosion! Museum of Naval Firepower - The story of the men and women who serviced the armaments of the Royal Navy. www.Wehrmacht-history.com - The primary focus of Wehrmacht History is on all military vehicles, planes, ships and weapons from 1935 to 1945 used by Heer (Army), Luftwaffe (Airforce), Kriegsmarine (Navy), U-Boats (Submarines),Waffen(Hitler's Elite) and secondary their leaders. Click here for movie footage of HMS Vanguard. This will take you to the British Pathe website where you can download and watch newsreel clips of HMS Vanguard throughout her career. Enter "HMS Vanguard " into the search box and click "Search"
www.godfreydykes.info Any questions you have will be answered here.